Mysterious and intriguing: this are the reasons of so much success of this mask, the so called Moretta (meaning "Dark", because of its color). 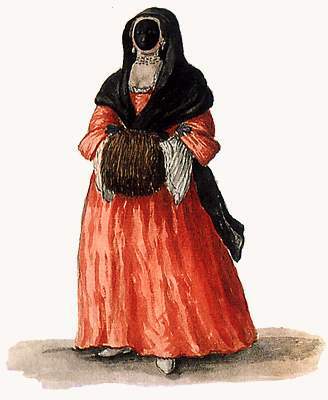 Used by women only, the mask was kept in place by a button, held by the front teeth. Rather uncomfortable for sure, but that's the way fashion has always been. The forced silence to which these women were forced specially pleased the male counterpart … maybe the venitian women were known for being too talkative?